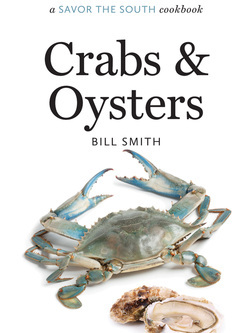 Reprinted with permission from Crabs & Oysters, a Savor the South Cookbook (The University of North Carolina Press, 2015). When you are ready to eat, put empty shells in a hot oven. Put Champagne in a large skillet or wide-bottomed saucepan and bring to a gentle simmer. Arrange warmed shells on a platter or on plates. Gently slide oysters into simmering wine along with 1/2 cup or so of their juice. Cook them just until they begin to curl a little, 1 minute max. Put 1 oyster into each warmed shell. Turn heat to high and quickly whisk in curry and butter. Whisk vigorously and allow wine to reduce and thicken just a little. Season oysters with salt and pepper. Add parsley to the sauce and spoon a little over each oyster. Serve at once. Serve with Champagne, of course, and any of the leftover broth. *You’ll need to work quickly and have everyone ready to eat these. Poached oysters don’t sit well for long. If you are not comfortable cooking so many of these at once, it is fine to cook and then bring them to the table in smaller batches.